If you are the admin, you can edit the settings for the document folder path and the document folder structure in the InLoox Options . As of InLoox version 9.0.12 admins can also set rules for the creation of document folders. 1. Open the InLoox PM options by clicking on File and afterwards directly below InLoox PM on options. 2. The dialog box Options opens.Click on Documents on the right side of the box and afterwards on Document Store. 3. Select the Automatically update document list on project startup check box to automatically refresh the document list when opening a project. This feature slows down the opening progress of a project, but ensures that the document list displays the latest status of the document folder. 4. 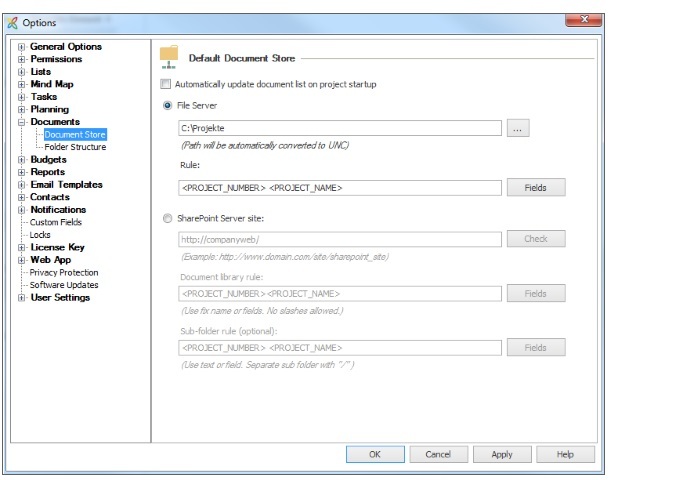 Choose between File Server and SharePoint Server site as default document store. 4.1 When you manage your documents on your own computer or on a file server, choose File Server. Afterwards click on to select a folder and then click on OK. In the Rules field you can define the folder structure. To define a rule you can use the following fields: Project Name, Project Number, Company Name, Company Number, and Division. 4.2 When you manage your documents on a SharePoint server, choose SharePoint Server site. Enter the path to your SharePoint server, like http://company/web or Http://www.my-sharepoint.com/site_intern/, in the first field. 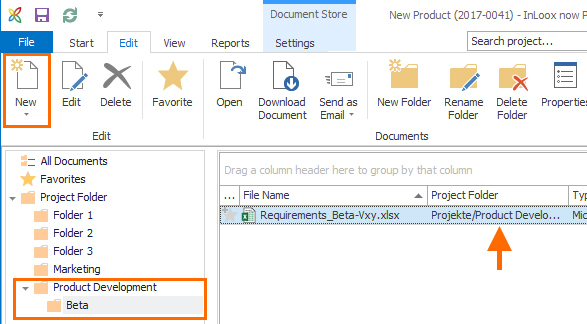 Document library rule and Sub-folder rule (optional): Here you can define the structure for the SharePoint document library and – if needed – for sub-folders. You can enter any text (and use one library for all projects) or use fields to define a rule (see Rules in the file server section). The advantage of using a rule and creating one document library for every project is that you can individually control the access permissions of the different project libraries. If there haven’t been any projects yet, changing the settings has no effects. New projects will be created on base of the new settings. If you have existing projects and you change the settings, all new projects will be created on base of the changed settings. All existing projects will be continued with the former settings, unless you change it manually in the project. The InLoox PM options allow you to individually define the folder structure for the document area. Thereby, you can automatically create subfolders in every document folder. You can create as many subfolders as needed. For example, when you create a new subfolder (e.g. marketing) in the InLoox PM options. This new subfolder is created in every project document folder. 1. Open the InLoox PM options by clicking on File in the left corner. Afterwards click on Options below InLoox PM in the side panel. 2. Click on Documents and then on Folder structure. On the right side you will see the Folder structure area. 3. Click on OK or Apply, to save your changes. 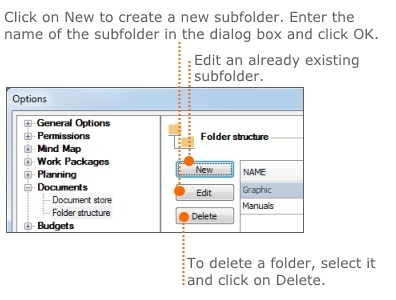 Existing subfolders are not deleted or renamed, when the subfolder structure is changed. The new structure is applied to already existing projects, when new documents are added. In order to use this feature, you have to download InLoox version 9.0.12 or higher. In Outlook, click on File and open the InLoox Options. In the side panel, click on Documents and then on Folder structure. Click on New to create a new folder. If you want to set a rule for this folder, activate Create if. Click on Fields, to select which field needs to have a certain value. Select, e.g., Division. In this example, we want to create the subfolder “Product Development\Beta” only if it is a project of the division IT-Beta Team. IMPORTANT The regular expression must exactly match the value used in the field. If the division is called “IT-Beta Team”, the rule will not apply if you enter „it-beta team“. If you create a new project and click on New in the Documents section, the new folder structure is automatically created based on the newly set rules. Folder 1 is only created if the project number starts with „2017-„ (the year followed by a minus). Folder 2 is only created if the division „IT-Team Beta“ is selected for the project. Folder 3 is only created if the project name starts with the letters „Intern“ followed by a space (e.g. „Intern digitalization project“ or „Intern revision 2016“). PLEASE NOTE New rules are not applied to existing projects. They only apply for newly created projects. PLEASE NOTE If a value for the regular expression does not exist, InLoox warns you with an x next to the field. The value for the regular expression must exactly match the value used in the field. You can set several OR-rules for one folder. Simply create each rule for the same folder. InLoox will then create the folder if one of the rules applies. 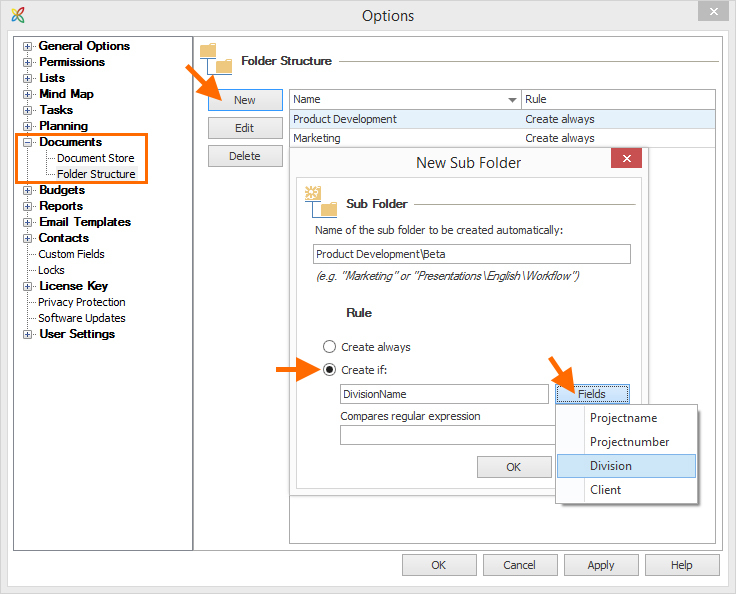 In this example, the Folder 3 will be created if the project name is „Intern“ followed by a space or if the customer in the project is „Intern“. PLEASE NOTE You cannot create AND-rules. If you want to edit a rule, mark it and click on Edit or double-click on the rule. Now you can change the values for the rule. Click on Apply or click on OK to apply the changes an close the InLoox Options. If you want to delete a rule, mark the rule and click on Delete. InLoox will ask you, if you really want to delete the rule. Confirm by clicking on Yes. PLEASE NOTE If you delete a rule, this will not affect existing folder structures. The rule will only no longer be applied for newly created project document folders. Documents • Copyright 1999-2019 © InLoox, Inc. All rights reserved.